The Permanent Secretary, Federal Ministry of Information and Culture, Deaconess Grace Isu-Gekpe, has said the ministry is leveraging on Information and Communication Technology (ICT) to drive and expand the national production frontiers in information, culture and tourism in line Economic Recovery And Growth Plan, reports ITREALMS. Pix: From left: Project Manager, European Union Support for Federal Government Reform Programme, Michelle Delgado; Director ICT, Federal Ministry of Information and Culture, Mrs. 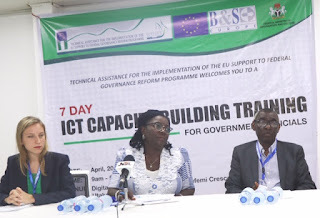 Comfort Ajiboye; Team Leader, European Union Support for Federal Government Reform Programme, Professor Lasemi Bello at the opening of a 7-day capacity building programme for staff of the Federal Ministry of Information and Culture in Abuja on Thursday.